Put the Web to Work: Does your Facebook page look a little different lately? Does your Facebook page look a little different lately? One of the biggest changes is a wider, single-column view for posts. Photos are now wider with a new 504 pixel width. The column feed is ¼ larger than previous photos. Photos can now be 504 pixels by 504 pixels, so take advantage of this feature! This is a one stop place to go to see all of your notifications. You can view, respond to and manage messages to your Page…we love this feature! 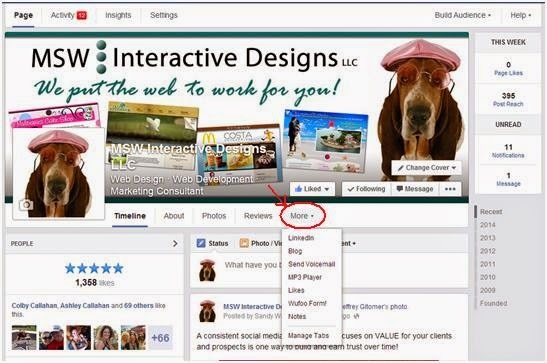 If your local business page allows reviews, the review area of the page is now much more prominent. It’s at the top left of the page right under your profile image. Reviews can be a POWERFUL tool for your business. Be proactive in responding to reviews to show that you’re engaged, active and caring! Posts to your page are also on the left side and are much easier to see than in the old layout. Another nice feature is available by hovering over the stats area at the top right of your page. You have a great deal of info available to show you how far your posts are reaching, what posts are working well, and notifications and messages on your posts. Business Facebook is a powerful tool for your business and these changes should help you manage your page better. 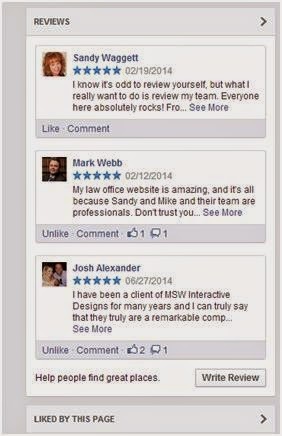 If you have any questions about the new Facebook look, please give MSW Interactive Designs a holler! We can help with your Facebook and other social media marketing efforts.